Thomas Fitzpatrick, known to his friends as Tommy Fitz, was a native of Washington Heights, Manhattan, who, although he had moved to New Jersey, still hung out with his old friends from the neighborhood. A “wild bunch,” Tommy’s crew were adventurous and enjoyed frequenting area bars. Late in evening (or rather early in the morning) of September 30, 1956, as he was leaving a tavern on St. Nicholas Avenue in Manhattan to return home, Tommy bet one of his buddies he could make it back to the bar from New Jersey in a mere 15 minutes. This, of course, is impossible by car. So after leaving the bar on that September night, Tommy traveled to the Teterboro School of Aeronautics in New Jersey where he then stole a single-engine plane. Hoping to evade authorities until his return task was completed, he took off without lights at around 3:00 a.m. According to reports, his original plan was to land the plane at the field of George Washington High School, just a few blocks from the tavern, but since its lights weren’t on that morning, a drunken Tommy chose to land the plane in front of the tavern itself on St. Nicholas Avenue near its intersection with 191st street- managing to thread the needle, successfully avoiding lamp posts and parked cars in his landing. 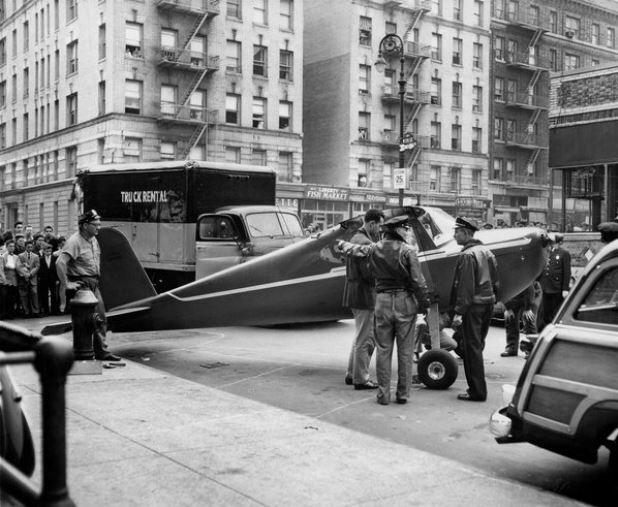 Of course, landing a plane in the middle of a street in Manhattan was bound to get noticed and the cops were called in. Eventually charged with grand larceny, Tommy was never convicted since the plane’s owner, presumably amused by the whole thing and with no harm done to his plane, refused to press charges; however, since the city’s ordinances prohibited landing planes on its streets, Tommy was fined $100 (about $800 today) and had his pilot’s license suspended for six months. Just over two years later, again after imbibing at a Washington Heights bar, Tommy repeated the feat. This time, Fitz had been telling the story of his first flight when another patron questioned the authenticity of the story- read called him a liar. His honor put to the question, at about 1:00 a.m. on October 4, 1958, the inebriated Tommy again went to the Teterboro School of Aeronautics in New Jersey and “borrowed” a plane to fly back to New York City. This time he landed the plane at the nearby intersection of Amsterdam and 187th Street. After landing the plane, he initially fled the scene. 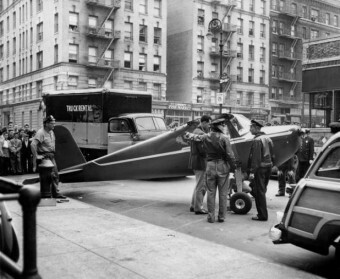 However, when police were called in and once again found themselves with a plane sitting in the middle of a Manhattan street, and recalling the unique incident two years before just a few blocks away, they decided to go investigate and see if Mr. Fitz had something to do with this one too. At first, he reportedly denied it, but witnesses who saw him exit the plane and run off claimed it was him, ultimately inspiring Fitz to confess. With this second incident, there was no mercy. The magistrate judge, Ruben Levy, threw the book at him saying, “Had you been properly jolted then, it’s possible this would not have occurred a second time.” The 28 year old Tommy Fitz was sentenced to six months in prison for transporting stolen property. Beyond his flying escapades and little stint in prison, Tommy Fitz had a full life, serving as a Marine in the Korean War and earning a Purple Heart, enjoying a 51-year marriage to his apparently understanding wife, Helen, having three sons, working as a steamfitter and living to the ripe old age 79, dying in 2009. Starting from Helsinki-Malmi Airport, and claiming he was headed to Stockholm before taking off, Rust made the attempt. Along the way, he was warned off several times, had Soviet Air Defense tracking him, and had soldiers repeatedly requesting permission to shoot him down, but were denied each time. On top of uncharacteristic restraint by Command, a series of gaffes on the military’s part allowed Rust to make it to the Kremlin without being destroyed. However, along the way he decided his original idea a bad one, as he assumed he’d just be arrested inside the fortress and that the government would deny the event, so no one in the public would know what he did. Instead, he decided he’d try landing in Red Square. However, after a pass over the square, he found there were too many people walking around to make that feasible. He ultimately landed on a bridge by St. Basil’s Cathedral around 7:00 pm on May 27, 1987. After the landing, Rust was, of course, arrested, and ultimately sentenced to four years in a labor camp in the Soviet Union. However, two months later as a sign of good will to the West, Mikhail Gorbachev ordered Rust be released. It has been claimed by retired U.S. 3-star general and former Director of the NSA William Odom that the military mistakes that ultimately allowed Rust to penetrate the Soviet Union’s vaunted defenses and fly over the Kremlin allowed Gorbachev to remove many of his strongest military opponents, with the event severely tarnishing the military’s reputation in the eyes of the public. And, indeed, as a result of Rust’s little adventure, the likes of Sergei Sokolov, the Minister of Defense Marshal, and Alexander Koldunov, the Commander-in-Chief of the Soviet Air Defence Forces, were dismissed from their positions, among others- according to Odom helping to expedite the collapse of the Soviet Union. Upon returning home to Germany, Rust managed to make a cool 100,000 DM (adjusted for inflation and converted to U.S. dollars, about $102,000 today) by granting Stern magazine the exclusive rights to interview him for his official version of the story. Hopefully he saved some of that for a lawyer, because just two years later Rust was arrested for stabbing and nearly killing a female co-worker at West German hospital where he was doing community service. The woman in question had reportedly rejected Rust’s romantic advancements. Rust ultimately served 15 months in prison for attempted manslaughter. My wonderful mother-in-law Mary Serret, nee Morton passed away on November 30, 2018. Mary was born (1937) and raised in Washington Heights. About 10 years ago at a party she confessed that she was on the plane with Tommy for the first flight. She was in the bar when the bet was made and he asked her if she wanted to take a ride to New Jersey with him. She said she did not realize they were stealing the plane because the keys were in it (she was very gullible). When they landed she said she was so scared she jumped out of the plane and ran home. She never told anyone for all those years because she thought she could still get in trouble. It made her a bit of a celebrity in the family.